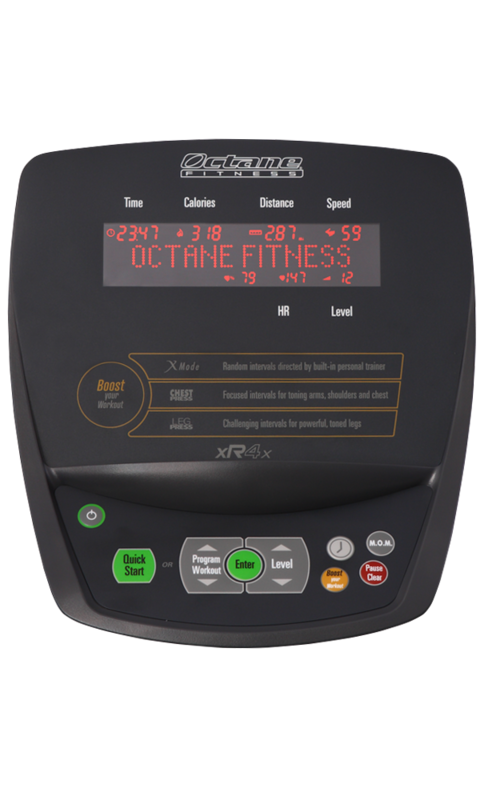 The unique xRide recumbent elliptical from Octane Fitness has revolutionized seated workouts, and the xR4 model is a high-quality, total-body elliptical machine for home use. Its exclusive design with PowerStroke technology enables exercisers to benefit from 343% more glute activity and 23% greater caloric burn than recumbent bike riders. Learn about this elliptical's 3 Workout Boosters. Spice up any workout (Quick Start or Preset Program) by pressing a Workout Booster button on the console at any time. You can modify the resistance level at any point during the workout. Combine leg strengthening and cardio, as once a minute, this Workout Booster cranks up the resistance by 10 levels for a vigorous, 15-repetition set. Make sure to hold the stationary handles to keep the muscular focus entirely on your lower body. • Push-Legs – concentrate on pushing the pedals to focus on your quadriceps and glutes. • Pull-Arms – concentrate on pulling the moving handlebars to focus on your biceps and lats. • Push-Arms – concentrate on pushing the moving handlebars to focus on your triceps and chest. • Reverse – pedal backward to switch up the muscular focus throughout your lower body. • Fast – increase your speed. • Resistance+ - work through a short surge of 3 extra resistance levels (7 levels higher than your base level). The invigorating Chest Press makes it easy to incorporate a strength session for your chest, back and arms into your aerobic workout. Once a minute, this Workout Booster cranks up the resistance by 10 levels and prompts you to use only your upper body for a muscle-burning, 10-repetition set.